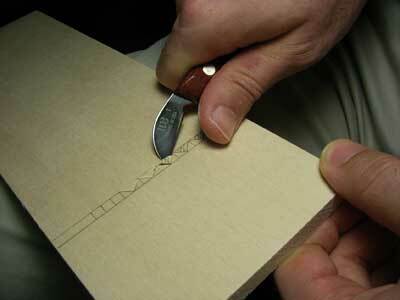 Chip carving is a great way to begin woodcarving. For those already acquainted with carving, much can be learned from the design and discipline chip carving has to offer. While there are a number of ways this particular style may be executed, the method practiced by the Swiss is the quickest, easiest and most pleasurable to learn. 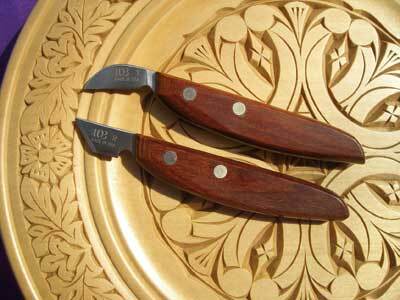 The tools required are few - two knives - the execution simple, and the results are attractively decorative. Chip carving differs in several ways from other disciplines of woodcarving including tools employed, the manner in which they are held, the way wood is removed, and designs created. 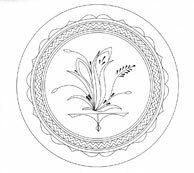 As chip carving does not create shapes or forms but rather decorates objects already in existence such as boxes, plates and furniture, geometric motifs that can be easily drawn with a ruler and compass have been traditionally utilised. This is readily understood considering the simplicity of the implements used and the nearly limitless design possibilities that can be made this way, including many that are quite clever and attractive. Designs carved in this fashion are cut into the wood or incised, not relieved. 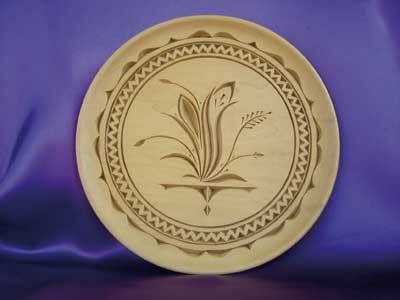 More recently, a non-geometric design style has been widely introduced to chip carving using a positive image approach that is expressed largely through the creation of, though not limited to, foliage such as leaves and flowers. 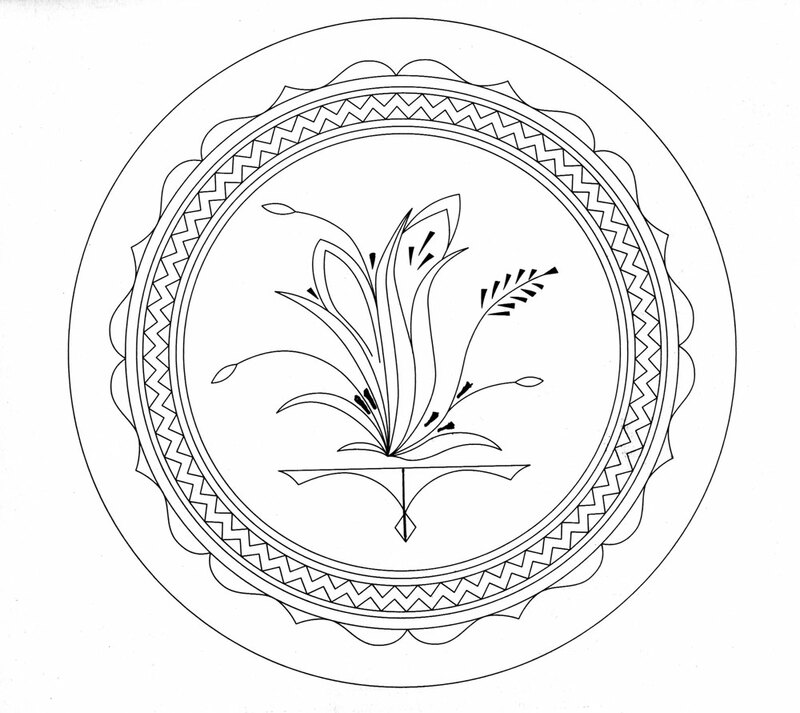 Positive image design is accomplished by removing the background of a design as done in relief carving, but using chip carving techniques. The result has the design at surface level, not incised as in traditional chip carving (see photo 2). Nearly all other disciplines of woodcarving done by hand, as opposed to that which is done with an electric tool, is executed by some form of shaving, whether whittling with a knife or manipulating chisels and gouges. 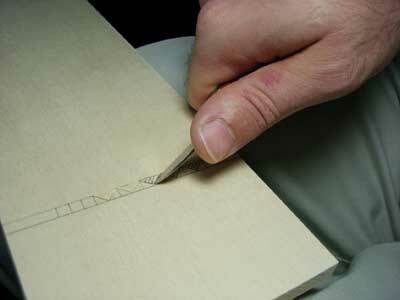 Chip carving is performed by making precise cuts or incisions in wood to remove specific shapes or chips. Interestingly, all chip carving is predominately an assemblage of two- and three-sided chips of various configurations and combinations. As all cuts by the nature of the style are precise yet often repetitive in their making, chip carving as a style of woodcarving moves along rapidly. 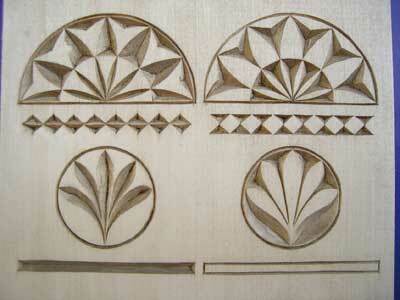 Chip carving can be, and has been done in the past using hardwoods - woods that are physically hard. 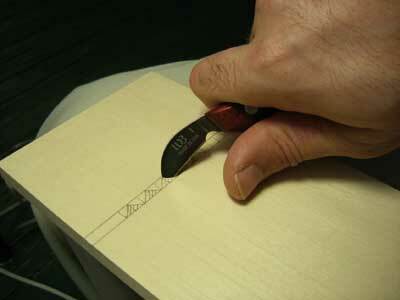 Such woods are normally carved with a chisel/skew and mallet. Today, softer hardwoods are generally used that may be cut easily with a knife. Most popular is the Linden family of trees (Tiliacea) which in Europe is commonly known as linden and as limewood (Tilia vulgaris) in the UK. The North American linden (Tilia americana) is commonly known in the US as basswood or whitewood. The Linden family of trees produce a tight, straight-grained wood ideal for chip carving. Other woods that do well for chip carving are: butternut (Juglans cinera) which has the grain of and is related to walnut but much softer and easier to carve; jelutong (Dyera costulata) which looks and carves like linden but is more expensive and may prove difficult to locate; and some of the five needle pines such as Eastern white pines (Pinus strobus) which are also easily carved but have a tendency to split. 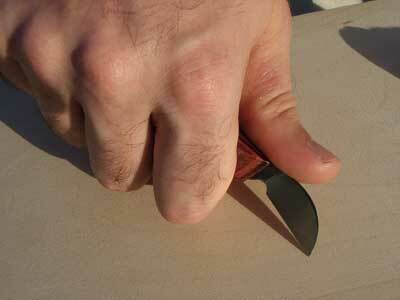 When only two knives are used, give yourself every advantage by acquiring quality tools (see photo 3). The Premier knives shown here were designed by myself and are the result of many years of study and experience. They are manufactured through the Alpine School of Woodcarving in the US. Their blades are high carbon tool steel (not stainless) properly tempered to hold an edge longer; their handles are ergonomically designed for hours of comfortable use. The more used of the two, the cutting knife, is the one that removes all the wood, i.e., the chips. Its blade angle is configured downward to facilitate the carving process. The stab knife does not remove wood but rather decorates motifs and designs with wedge-shaped impressions by cutting the wood fibres and spreading them with a downward thrust (see photo 4). 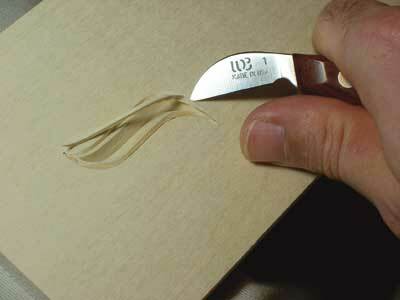 For most beginner carvers and many seasoned ones as well, sharpening knives often is considered a mystery. This may be especially true for chip carving knives for unlike carving disciplines that shave to remove wood, the chip carving process requires the cutting knife to be inserted and then pulled through the wood. 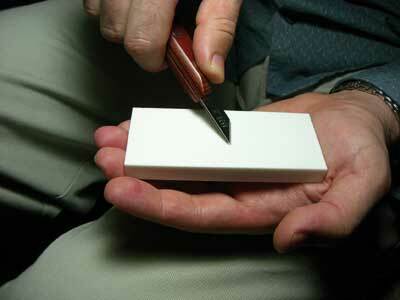 The secret to sharpening is knowing what the end result should be and how to get there. 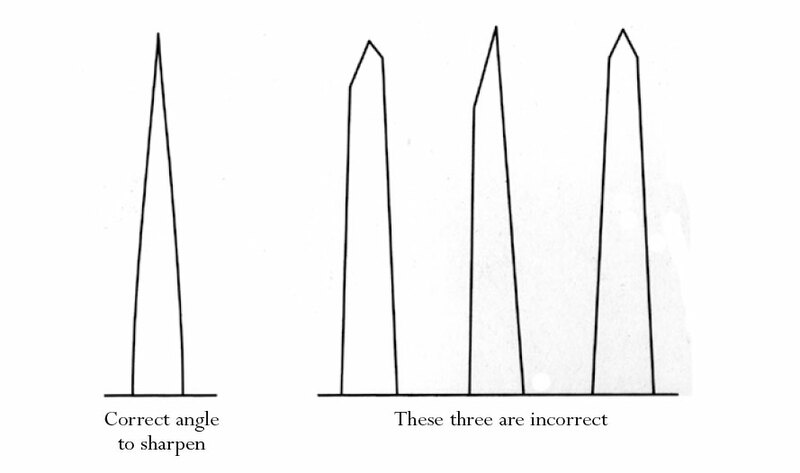 There are three criteria for properly sharpened chip carving knives. They are: a very sharp edge that is straight; an edge that is sharpened at the correct angle; and polishing the blade to a mirror finish. 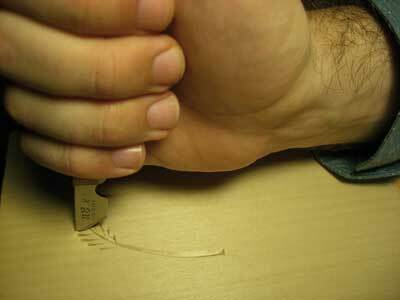 Whatever is used to sharpen, it must be flat or the blade edge will never be straight, forfeiting its efficiency. Ceramic sharpening stones - a medium grade for shaping and sharpening, and an ultra-fine for polishing - will perform the above task quite nicely. They are very hard and will remain flat without the need to be dressed. When preparing to sharpen the cutting knife, there should be a slight secondary bevel that blends into the primary bevel which has been established by the factory. 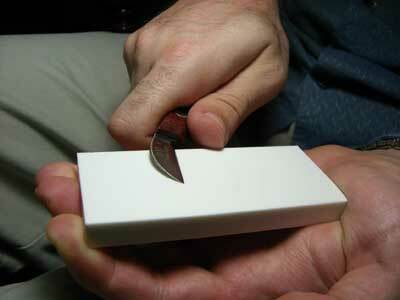 This is achieved by holding the blade just a couple degrees off the medium stone when sharpening (see photo 5). Work both sides of the blade equally. Repeat the same process when polishing with the ultra fine stone. 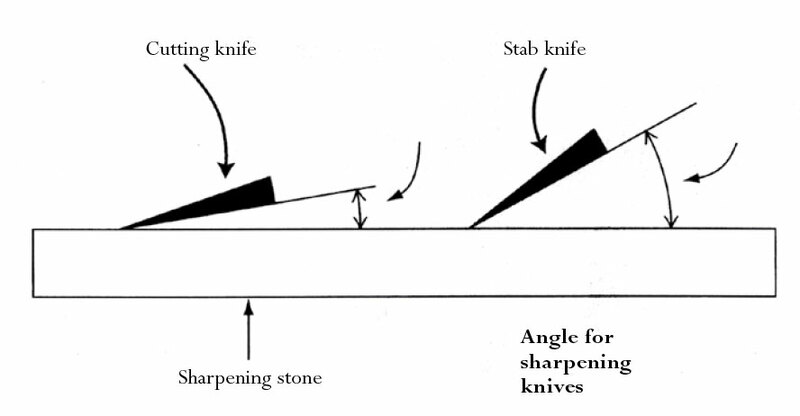 The stab knife is prepared the same way except the original broad angle established by the factory should not be altered (see photo 6). always be against the handle so all cuts are made by pulling from the shoulder and not made as one would peel potatoes. Nearly all cuts will be made in the first position. The second position of the cutting knife puts the blade at the same angle but in the opposite direction (see photo 8). 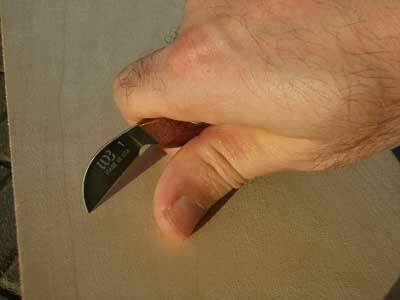 This is achieved by placing the first knuckle of the thumb on the spine of the handle. 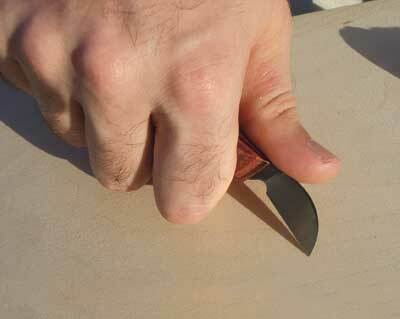 The stab knife gets its name from the way it is held, with the thumb over the end of the handle and the cutting edge facing you (see photo 9). To make its mark, it is thrust straight down and the length of the stab is determined by how far the knife is rocked back. It is never drawn back (see photo 10). 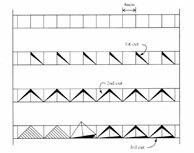 It could justifiably be said that the three-sided chip - or three-cornered - is the backbone of chip carving for it is used most frequently. Its configuration may be straight cuts or compound curves. To practice a simple three-cornered chip, start by drawing a row of 4mm (5/32in) squares on a practice board - 100 x 300 x 10mm (4 x 12 x 3/8in) will do nicely. 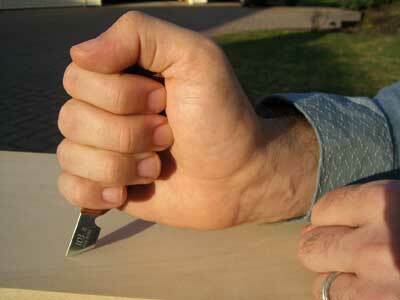 The following steps are for right-handed carvers. If you're left-handed like me, do just the opposite. 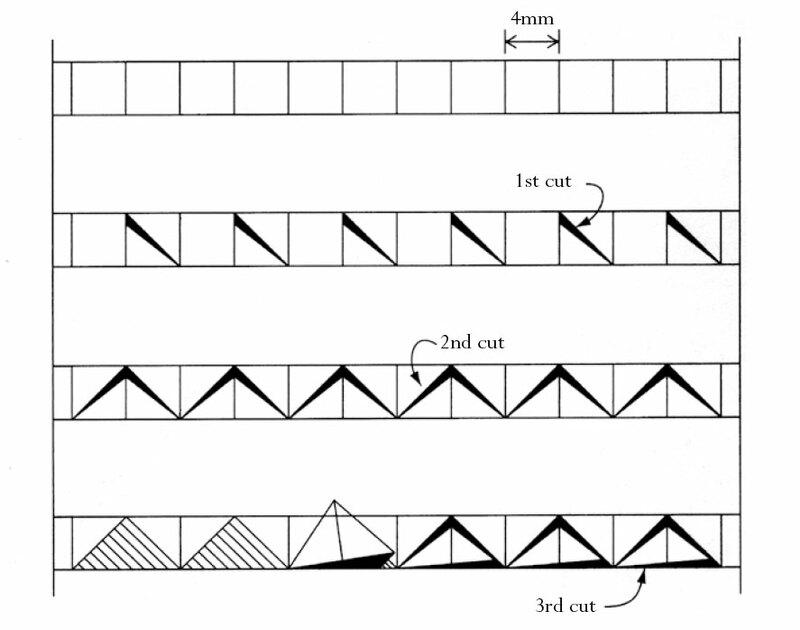 Starting on the right side of the board and holding the knife as previously described in the first position, thrust - not draw - from the top left-hand corner of the first square to the bottom right-hand corner, skip a square and continue repeating this procedure of cutting one square and skipping the next (see photo 11). 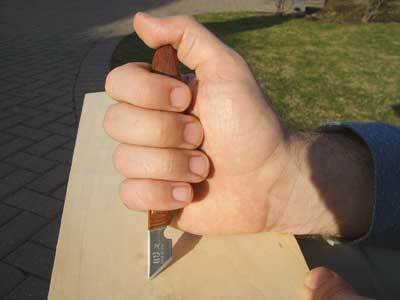 Now turn the board 180 degrees and hold the knife in the second position. With the blade facing away from you, place the point of the knife exactly where the first cut was started and thrust to the opposite corner of the squares that were skipped, cutting from upper right to lower left (see photo 12). Without turning the board, go back to the first position. Because the base of the triangle is longer than the two sides, the third or relieving cut is made by drawing the blade downward and across the baseline (see photo 13). When done correctly, the chip will pop right out. 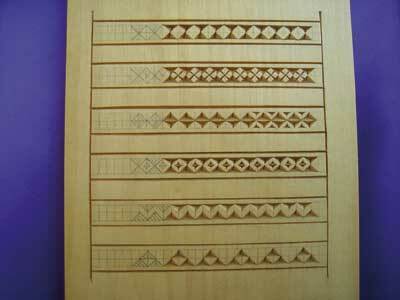 This simple three-cornered chip, when combined with others like it and repositioned or reconfigured, can make a variety of borders that are quite different from each other (see photo 15). The two-sided chip may be expressed in multiple ways including straight or curved lines having the same width value throughout; a chip having one side straight and the other curved; and chips with compound curves of various widths (see photo 14). While these are only the beginning steps of chip carving, a little practice will quickly give you the discipline and understanding of the complete process. It will also provide the incentive to explore and discover the full design possibilities and joys of chip carving, the most decorative, versatile, functional and fastest style the world of woodcarving has to offer (see photo 16). "The three-sided chip is the backbone of chip carving"